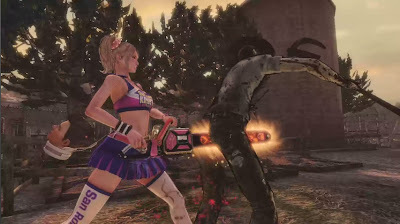 Recently, Warner Bros released a new trailer for Lollipop Chainsaw looking at the game's combat and the many ways to destroy a Zombie! Think you’re ready for the zombie outbreak that’s about to descend in Lollipop Chainsaw? Think again. Until you get up to speed on some of the wicked combat moves, you don’t stand a chance. Do yourself a favour and prepare for the impending apocalypse by watching Juliet Starling use skull-crushing combos, heavy weaponry and array of unlockable costumes, moves and upgrades to destroy every undead enemy unfortunate enough to cross her path.